Kent Paranormal is attending a paranormal investigation hosted by Ghost Hunter Tours at Dover Castle in Kent. 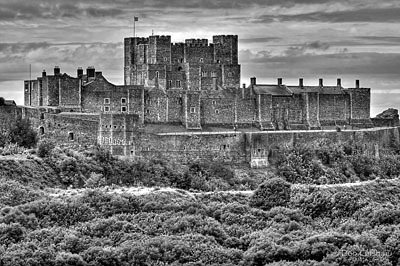 Dover Castle is a Medieval castle built in the 12th Century in Kent, England. Records show there has been a fortified site here since Saxon times, and its key defensive position has seen it in the past often referred to as the “Key to England”. Built to protect England’s shores from marauding pirates and later, Napoleon’s army, it’s now best known for its role in WWII and its ‘secret’ underground command centre, often frequented by Winston Churchill when he was Prime Minister. The battlements are said to be haunted by the headless ghost of a drummer boy who was murdered during an errand involving a large sum of money. It is believed the boy was decapitated by his assailants who took the money that he was carrying. His decapitated spirit has been seen numerous times across the castle grounds, often heard banging his drum. Within the stone walls of the old keep, the apparition of a woman in a red dress has been seen, as well as a cavalier. In the ‘secret’ underground tunnels, the ghosts of World War II soldiers have been seen and felt, going about their daily duties. It was here that an American couple heard violent screams and cries for help. Believing the sounds where part of a re-enactment, they were startled when they were told there were no events happening that day. Disembodied voices have been heard during the night, doors have often been witnessed opening and closing of their own accord. Sudden unexplained drops in temperature has also been reported.